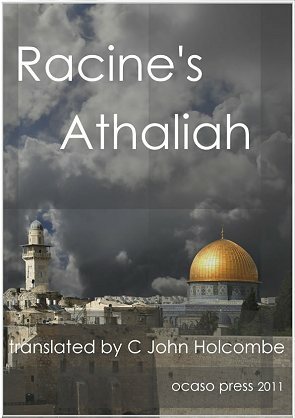 Ataliah (Athalie) by Racine: English Translation as a free pdf ebook. Racine's Athalie or Athaliah was written for private performance at court, and has something of the gloom and piety that marked the later years of the Sun King's reign. It was staged in 1691 by the convent girls at St Cyr, and so belongs to the period between the Counter-Reformation and the grand operas of the following century. The first attempted to bring the majesty of God down to earth in magnificent music, ceremony and architecture. The second aimed at spectacle and stunning stage effects. With its extended choruses (though unperformed in Racine's lifetime, and a troubled history for the play as a whole thereafter), Athaliah is indeed close to opera, but of a peculiarly religious kind. The stern teachings that underlie Athaliah cause problems for modern audiences. Austere and more successful in stagecraft than in creating sympathetic characters is probably the common impression. But Voltaire, no great friend of the French court, considered it one of the great achievements of the human mind, excelling anything of Shakespeare's. Flaubert greatly admired the work, and Gide praised the chorus sections. Like all Racine's work, the play is not naturalistic but poetic: it succeeds or fails as the poetry succeeds or fails. We miss what Racine intended by complaining that what little warmth emanates from the play comes from the minor characters: the honest but simple Abner and the long-suffering Princess Jehoshabeath, who meekly follows her husband's dictates. Similarly with Joash. His is a cloistered virtue, doubtless, but if he comes over as something of a prig that is all to Racine's purposes. The untried youth was to turn apostate in his later years, as Racine takes pains to emphasize, in the Introduction and the play itself, because man is born into sin, and cannot escape damnation by his own efforts. Racine was not writing fiction, but dramatizing something that was importantly true. The choruses put the matter plainly, and the play fails if we simply respond to them as poetry. A free e-book in pdf format includes the French text, glossary and notes on the translation. Jean Racine was born to modest circumstances in 1639, orphaned at a young age, and brought up on charity. He was given a first-class education by the Jansenists at Port Royal, and spent a further two years at their college of Beauvais. Rejecting their sober teachings, however, Racine began writing for the theatre in 1660, and by the time of Phaedra, performed in 1677, had nine plays to his credit, several of them masterpieces of the French classical theatre and containing some of its greatest poetry. Phaedra was poorly received, however, and Racine retired to marriage and a court position, though returning a decade later with two further plays: Esther and Athaliah. He died of cancer in 1699. Athaliah was written for private performance at court, and has something of the gloom and piety that marked the later years of the Sun King's reign. It was staged in 1691 by the convent girls at St Cyr, and so belongs to the period between the Counter-Reformation and the grand operas of the following century. The first attempted to bring the majesty of God down to earth in magnificent music, ceremony and architecture. The second aimed at spectacle and stunning stage effects. With its extended choruses (though unperformed in Racine's lifetime, and a troubled history for the play as a whole thereafter), Athaliah is indeed close to opera, but of a peculiarly religious kind. We can stay on the outside, surrendering to the play as an accomplished work of art, but only as a work of art. Athalie/Athaliah is then a view of Biblical history at a certain time by a certain man, and not a model for a worthwhile and virtuous life. Many readers have found the queen a more generous and tolerant character than Jehoiada, for all that she meets the savagery of the time with a brutal statecraft that sheds innocent blood if necessary. Athaliah may have turned away from Yahweh, and have seated herself on a throne reserved for men, but her accomplishments are real and impressive. She is imperious and lustful for gold, but what contemporary ruler was not? Racine's treatment suggests his human sympathies lay with Athaliah, but she was nonetheless to be destroyed and the line of David continue with Joash and so on to Christ. We are so used to drama exploring the subtler shades of human psychology that we can forget that drama need not do anything of the kind. Athaliah presents memorable characters but does not refine their motivations. A threat existed in this Biblical episode to the appearance of Christ, who alone saves us from eternal damnation. God removed the threat. Otherwise, man remains as he always has been. Israel will again turn from the true faith. Contending interpretations of Christ's intentions will arise, and nations be plunged into error and bloodshed. Racine himself has seen the religious wars of France, and knows the hope for man lies on the other side of the grave, though none can tell what that will be. The Bibical episode no doubt appealed to Racine, providing a credible and fast-moving plot, a strong female lead, and the threat of violence. The playwright was also making atonement for his years of indulgence and error. But Athaliah has none of the quiet resignation and reconciliation that old age brings: it is an uncompromising play, which Racine's verbal skill makes even more challenging. Racine the commoner become courtier has some very hard things to say on the failings of courts, kings and priests. Yahweh is a jealous and vengeful God. Mathan is an odious character, who understands the sources of his thwarted ambition and self-loathing. Jehoiada, that unfaltering tower of rectitude, vanquishes the queen, but does so through treachery, in the Temple and under the promise of safe conduct. in He who's father to the fatherless. What does this mean? More than alluding to Jean Racine the orphan who eventually found a father in his religious faith, it is a pointer to matters more compelling than the Greek tragedies Racine knew so well. Where Greek city life was admittedly precarious, and the gods only occasionally beneficent, Jansenists accept that God moves to unknown and unknowable ends. Some of us will be saved, and many more will be damned to eternal suffering. It is Racine's outlook that gives Athaliah its particular frisson and chilling force. While the tragedy of Phaedra rises from flaws in the characters, the characters in Athaliah are not flawed but only limited, indeed almost monolithic in their inner workings. In such an absence of psychological shading, Racine has moved beyond depicting the frail vessels of humanity to more essential matters. They are not lovable, these embodiments of God's purposes, but they are magnificently compelling. Only the queen weakens, it must be supposed, when the Lord parts the waves of her suspicious mind to allow pity to enter, for a few hours only, but sufficient to preserve Eliacin from vengeance and have Jehoiada's plot succeed. Otherwise, there are no sub-plots or twists of fate to waylaid denouement. The conflicts are not resolved on the personal level, but by appeal to the chorus, to the Almighty himself. The plot is largely based on Biblical history. Athalie (Athaliah in this translation), widow of the king of Judah, has abandoned the Jewish religion for the worship of Baal, and believes she has eliminated other members of the royal family. In fact, however, the late king's son, Joash, has been rescued by Josabeth, wife of the high priest, and secretly raised in the Temple as Eliacin. Act 1. Abner, Athalie's general, assures Jehoiada, the high priest, that he would support a descendant of the king of Judah if one appeared. Jehoiada agrees with Josabeth to reveal the existence of Joash, intending to dethrone Athaliah and return the country to the old faith. Act 2. Athalie goes into the Jewish temple and finds a child, Eliacin, whom she has seen in a threatening dream. Not knowing that this child is Joash, she aks Jehoiada to bring him to her, and then invites the child to live with her at the palace. Act 3. Fearing what the dream foretells, Athalie demands Eliacin be sent as a hostage. The high priest decides to hasten the restoration of Joash to preclude plots by the treacherous Mathan, the chief priest of Baal. Act 4. Eliacin is revealed as Joash, the true successor of the kings of Judah. The priests barricade the Temple. Act 5. Athalie prepares to dislodge the rebels from the Temple. She comes under promise of safe passage into the Temple to claim Eliacin and the reputed treasure of the place. Joash is then proclaimed king, when armed priests seize Athaliah and kill her guards. The army besieging the Temple flees. Athalie is executed. were laws as handed down from Sinai’s hill. that priests were scarcely equal to the task. who dare recall to us the ways we knew. 20. as curse the name their fathers called upon. those last few vestiges of feigned respect. What do these dark presentiments presage? Can you be holy and escape her rage? is long what Athaliah must condemn. 30. her mind with dark suspicions of revolt. She envies merit in another's life. in search of virtue to dispatch or hound. 40. in ministering to Baal and vile affairs. the greatness from it of the God he left. with depths that cloak his baleful scheming there. what salves her sovereign appetite for gold. 50. is known the treasure of King David's throne. two days, has shown a shrouded, sombre cast. a God that injured and her force repelled. 1. Bernard Weinberg. The Art of Jean Racine (Univ. Chicago Press, 1963). 2. Peter France. Racine’s Rhetoric (Clarendon Press, 1965). 3. Gordon Pocock. Corneille & Racine: Problems of Tragic Form. (C.U.P. 1973). 4. Roy Lewis. On Reading French Verse: A Study of Poetic Form. (Clarendon Press, 1982). 5. John Cairncross (trans.) Racine: Iphigenia, Phaedra, Athaliah. (Penguin Books, 1963). 8. Jean Racine. Athalie http://en.wikipedia.org/wiki/Jean_Racine. 9. Racine: Athalie. ABU : la Bibliothèque Universelle. http://abu.cnam.fr/cgi-bin/go?athalie2 French text. 10. In Libro Veritas: Athalie par Jean Racine. http://www.inlibroveritas.net/lire/oeuvre693-chapitre495.html French text. 11. The Complete Plays of Jean Racine. Volume 4: Athaliah. Translated into English by Geoffrey Alan Argent. Pennsylvania State University Press, 2012. 12. Royal DisClosure: Problematics of Representation in French Classical Tragedy by Harriet Stone. Summa Puplications, 1987. Google Books.